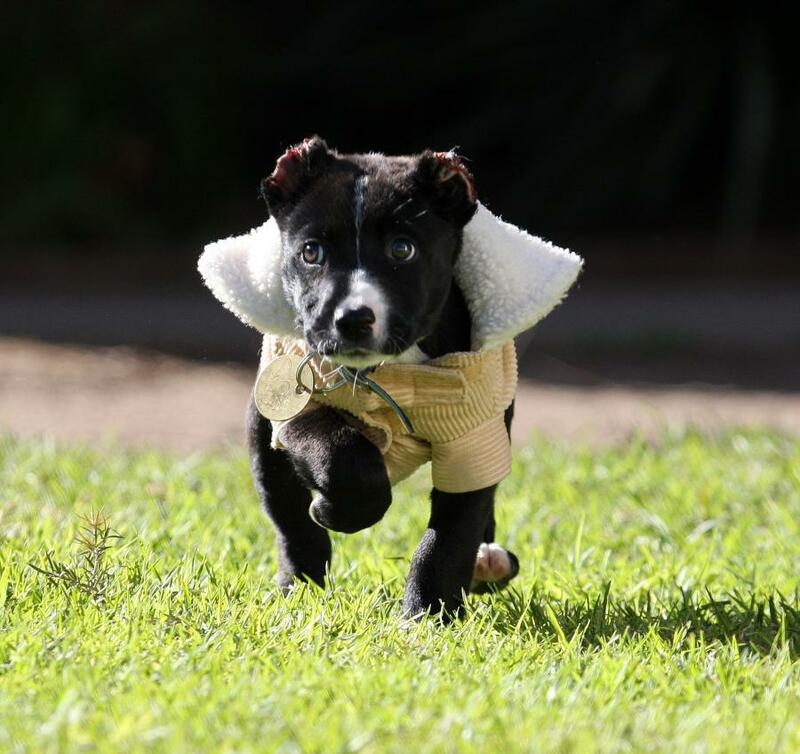 Buckley has just turned nine weeks old and, now in safe hands, is on the slow road to recovery. After being cruelly tortured just over a week ago, he is making reasonable progress, both emotionally and physically. On Sunday he enjoyed some quiet time after being the centre of a great deal of media and public interest. He continues to receive daily treatment for his injuries in The Lost Dogs’ Home’s veterinary hospital and is lavished with lots of attention, love and care from staff who visit him regularly. He is never without human contact although is still understandably wary of strangers. Buckley has been showered with toys and food donated by generous members of the public. He is enjoying his cozy, warm blanket donated by Caroline Springs resident Ginnie Martin. Like any pup, he is chewing all his toys and yapping whenever he feels he wants some extra attention. He loves nibbling on fingers and giving licks to show affection. He snuggles into whoever holds him. Being so young, he would have only just been weaned from his mother and seeks comfort at every opportunity. The Lost Dogs’ Home has established Buckley’s Scholarship Fund, to pay for his ongoing treatment and care. Funds will also cover the cost of expert animal behaviourist Debbie Calnon to work with him to ensure he grows into a well adjusted, confident and happy adult dog. Debbie will teach him skills to help him feel safer in social situations and better able to interact with people and other dogs. Dogs that have been abused at the hand of a human are often unable to trust again. In addition, Buckley will receive obedience training from Planet K9’s Director, Nicole Beasley. Buckley and his new owner will benefit greatly from this ongoing training from Nicole and Debbie. The Home’s staff are sure that with time and expert support, Buckley will recover from his traumatic ordeal. Many generous members of the public have already donated to Buckley’s Scholarship Fund. The Lost Dogs’ Home would like to thank these people and those who continue to donate to ensure Buckley’s future is happy and secure. Buckley will be desexed this week, in preparation for adoption. While he is under anaesthetic, the veterinary team will take the opportunity to neaten the awful damage inflicted to his ears and tail. The Lost Dogs’ Home has been inundated with calls from concerned members of the public wanting to give him a good home. We very much appreciate these offers for Buckley, however, he will not be ready for adoption until mid-August. We wish to remind people that Buckley’s progress can be followed at dogshome.com. Thank you, once again, to everyone who continues to enquire about Buckley. It is a reassurance to our staff that so many people support the work we do in rehabilitating animals like Buckley and share our deep passion for animals.